Looking to purchase a new spot, buy an investment property, or pick up and move? SmartAsset recently published data on the top rising housing markets. In order to evaluate up-and-coming housing markets, SmartAsset looked at data on 308 cities with a population over 100,000, scrutinizing the change in median home values, median incomes, and the difference between population change and housing unit changes. The surprising news? Texas is smoking right now. 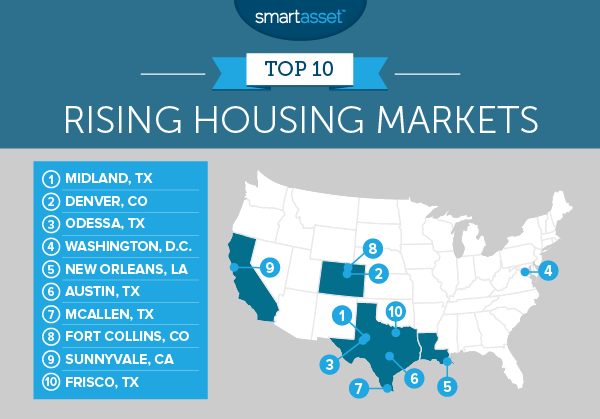 According to SmartAsset data, five out of the 10 hottest rising markets right now are in the lone star state. Number one on the list is not the ultra hip Austin, as you may have anticipated. 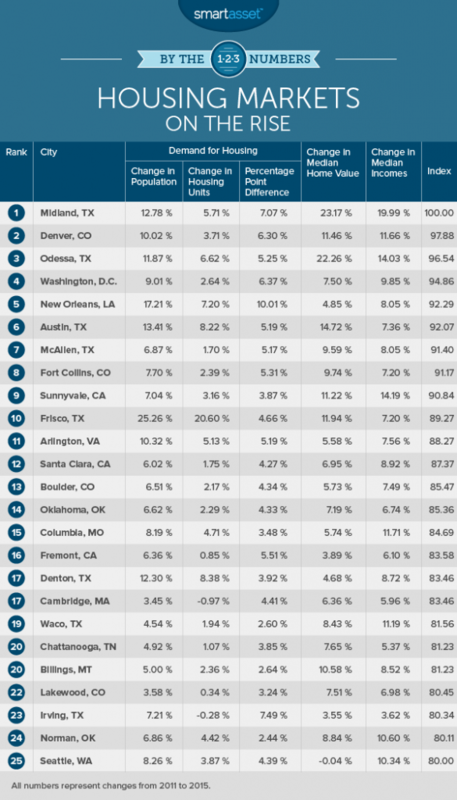 Austin took 6th place, but Midland, Texas landed the top spot. In Midland, the median house value rose 23 percent from 2011 to 2015 and median incomes rose almost 20 percent. Following Midland, Texas is Denver, Colo. Here, the population increased by 10 percent from 2011 and 2015. At the same time, the number of housing units only rose 3.7 percent, a clear recipe for a high demand market. Number three on the list is Odessa, Texas, another Southwest Texas town where both the population and median income is on the rise. From 2011 to 2015, the Odessa population rose nearly 12 percent, almost doubling the 6.6 percent growth in housing units. Still don't feel like moving to Texas? Number four on the list is Washington, D.C. This is the least affordable city on the top 10 list, but that doesn't seem to stop its housing market from heating up. In 2015, the median home value in the nation’s capital was $475,800, and yet it still seems to be rising. For number five on the list, we move down south to New Orleans, La. Along with access to great Cajun food and jazz, the folks of New Orleans have rising incomes—up nearly 8 percent from 2011 to 2015—which they can power toward housing. See the below infographics for more information on the top 10, and check out the full SmartAsset report for a breakdown of each locale.